rusty angel art life is filled with Pretty Things, enjoy them! : winner blog give away! and the winner is.......... DOLLS123!!! i don't know her real name, i know she lives in California! i've already mailed her to find out more about her so my gift will suit her! i like having a give away! i like making a present for someone once in a while so i'll be doing these give aways more often, and for no special reasons hihi! just when i feel like it! when i'm in a giving mood haha! i'm thinking of starting a blog challenge too, just thinking! i have so much on my plate at the moment so... that is for an other day. 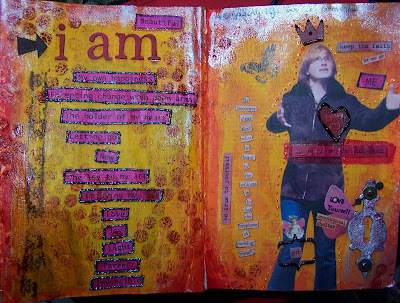 here is my journal page from yesterday... i'm still on my red, orange and yellow colours which a really good thing! we were talking about Paris Hilton yesterday! about her entering the Scap world! bling and all! so i had to use some really blingy Glitz stickles from Ranger ! i had to!! hihi! Be yourself and let them be theirselves! And I love your journal layout...seems like we're both on a red, orange, yellow kick lately. You go, girl! Love the colors you used on this journal. Nice to see you at Kars next week.